It's Friday and I'm still being a fail blogger! I wore this outfit earlier in the week to work but my heels stayed in my bag as I ran around the city in my trusty flats. I bought these new, tan, "city flats" from Gap that fold up to fit in your bag. They're pretty much just like ballet shoes but with thicker soles attached to the bottoms. Conclusion: I'M BUYING ANOTHER PAIR. They're fantastic, comfortable, and stay on my feet - no more sore soles for me! Hopefully they're still on sale. I'll make my brother take me to Gap when he picks me up from the train station. They remind me of my ballet years when I was younger. I wasn't horrible at it but I never had the patience to actually practice. I don't think I understood the concept of dancing and that practice makes perfect...especially when it comes to ballet. I thought it was just for fun (plus I was a huge fan of those tutus). So I probably won't debut it for a few days on my blog, but I got an impromptu haircut a few days ago. I got out of work early, met up with my friend Rob, and then had the brilliant idea of getting my bangs trimmed. I've had pretty much the same haircut since my sophomore year of high school and I love it to death; however, sometimes it's nice to change things up a bit. I decided to get blunt bangs instead of my usual side-swept bangs. Bad idea. The hairdresser cut them too short and uneven, and when I went to my usual hairdresser for help she even said there wasn't much she could do. All I could do was wait for them to grow out. Alas! This is probably a sign that I shouldn't betray my usual, trustworthy hairdresser. I've learned my lesson. Dear Bangs, please grow faster! I've noticed that I always get the worse bang trims from those chain salons. I've learned my lesson as well too. The outfit is adorable!! 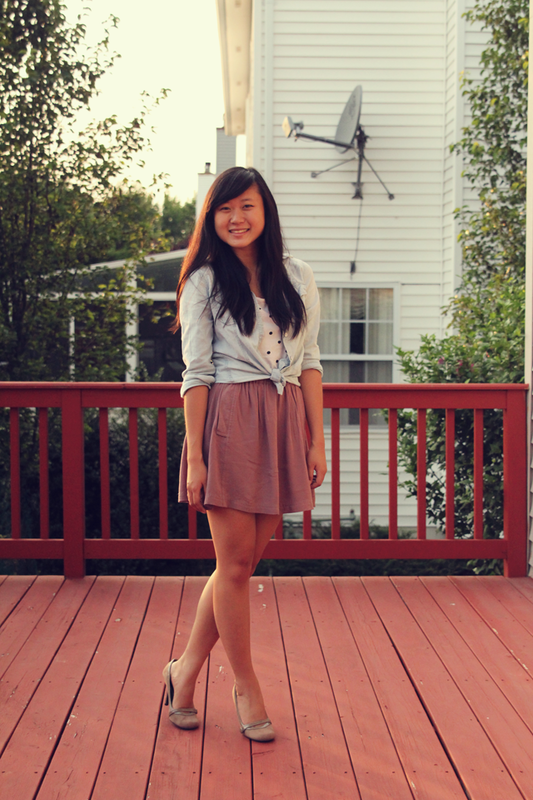 I really dig those pretty taupe heels. 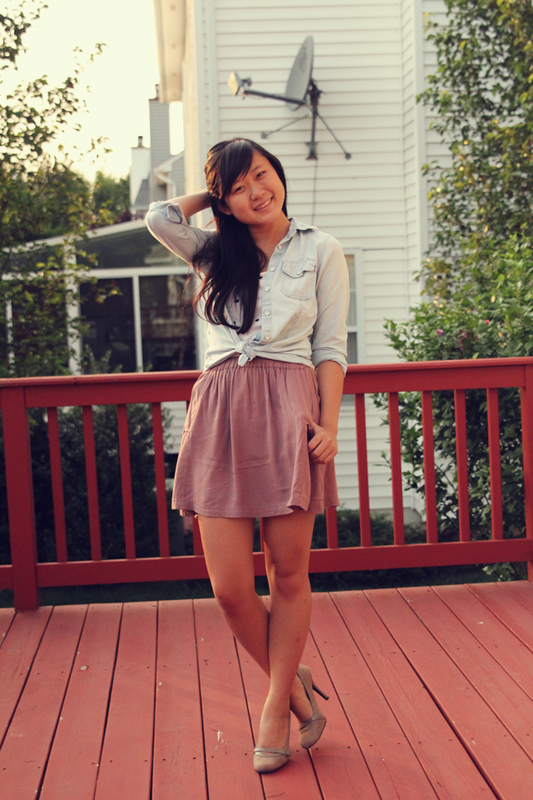 I recently got a denim shirt (sleeveless) so this outfit is major inspiration for me. I love how it´s so simple, yet so pretty. And yes, sometimes it´s nice to change things up a bit. But you should always be prepared, because things may not go as you hoped they would go. Maybe in a few days you will be more used to them, and before you notice, your bangs will be needing a haircut. Try to stay positive ( I know how hard that can be when it comes to hair). I love the outfit! 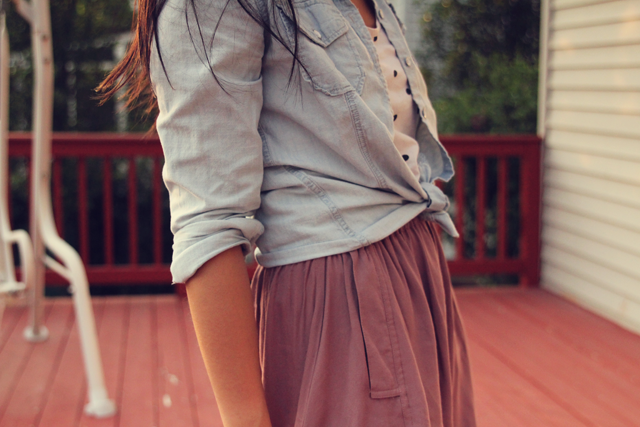 The skirt is fabulous! 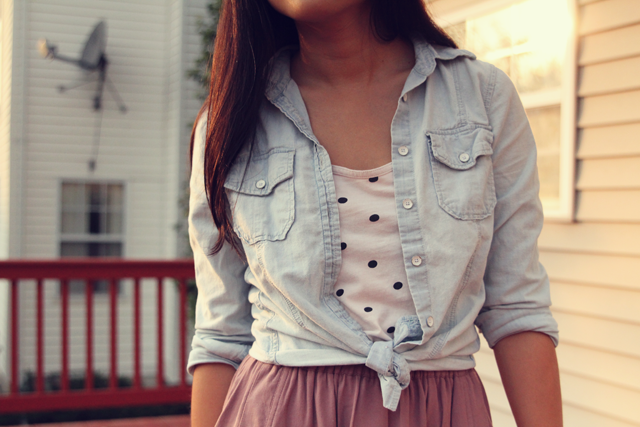 That denim top is so good for tying at the waist and making simple outfits not-so-simple! Loving the colors of this outfit Jen :) And those darling heels...I might just borrow them in NYC hehe!